This map is out of date! 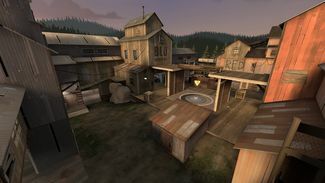 See cp_snakewater for updates! The main layout is based around having one main route and one flank throughout the map. A theme throughout the map is extreme height differences, with the mid having a bridge on top, and the second cap being overlooked by both a crane and two balconies. Emphasis has been put on making all classes balanced, not allowing any class to conquer the map singlehandedly. I've also tried to encourage aggressive play, allowing aggressive teams to control certain key areas, while still not making it impossible for a defensive team to get back on track.